Moments ago, President Trump released his Fiscal Year (FY) 2019 budget proposals, outlining his tax and spending proposals for the next decade. We will be publishing our full analysis of the President's FY 2019 budget later today, but this blog gives a brief overview of the budget and its contents. Stay tuned to CRFB and The Bottom Line throughout the day and the rest of the week as we take closer looks at all aspects of the President’s FY 2019 budget. The policies called for in the President's budget would reduce deficits by $3.6 trillion relative to its own baseline (and about $3.1 trillion relative to current law), the result of $1.2 trillion of new spending and tax cuts ($1.75 trillion relative to current law), $3.7 trillion of deficit reduction (mostly on the spending side), about $800 billion in reduced war and disaster spending, and a bit over $300 billion in interest savings. The budget also assumes a substantial amount of deficit reduction from faster economic growth, with $813 billion resulting from policies in their budget and an unspecified amount (likely well over $1 trillion) as a result of recently-enacted tax cuts and other changes in law. As a result of the claimed deficit reduction and economic growth in the budget, debt as a share of Gross Domestic Product (GDP) would rise from 77 percent today to 82 percent in 2022 and then fall to below 73 percent by 2028. Deficits would also ultimately decline – though not disappear. 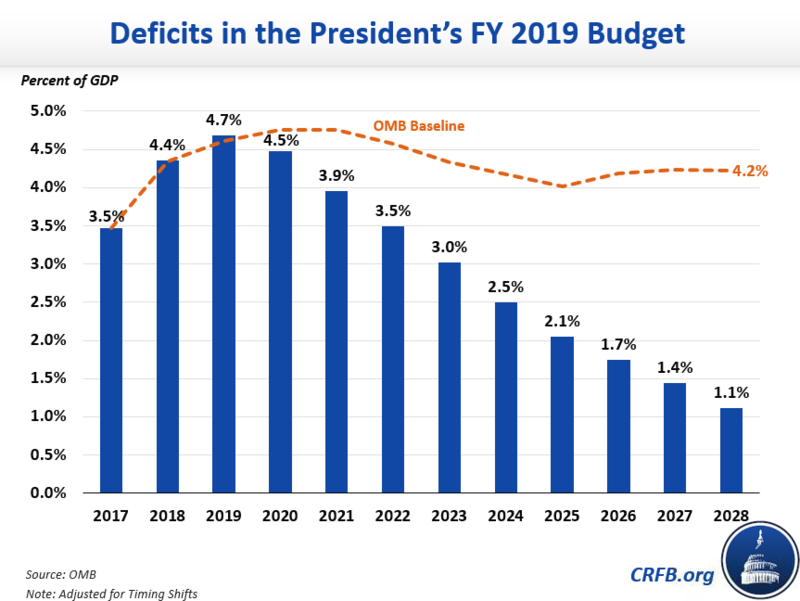 Under the President's budget's estimates, deficits would rise from 3.5 percent of GDP in 2017 to 4.7 percent of GDP in 2019, but then fall gradually to 1.1 percent of GDP by 2028. The budget calls for significant reductions in spending, the largest source being $1.5 trillion of cuts to non-defense discretionary spending (the budget was written before the recent budget deal, but an addendum suggest the retention of most of these cuts). The budget also proposes almost $700 billion in savings from repealing and replacing the Affordable Care Act (ACA or "Obamacare"); $400 billion in other health care savings (mostly Medicare reforms); over $300 billion from reductions in and reforms to safety net programs; $200 billion in higher education reforms; and over $150 billion in increased receipts from user fees, taxes, and premiums. The budget also calls for a number of spending increases, including over $800 billion in defense spending, $200 billion of infrastructure, and a variety of other initiatives. In addition, the budget calls for extending the individual income tax reforms from the Tax Cuts and Jobs Act (TCJA) beyond their December 2025 expiration – and assumes that $569 billion cost in its baseline. As a result of these changes, along with faster assumed economic growth, the Office of Management and Budget (OMB) estimates spending under the budget will eventually fall to its lowest level since 2004. Adjusted for timing shifts, outlays would rise from 20.8 percent of GDP in 2017 to 21.0 percent in 2019 before falling to 19.0 percent in 2028. Revenue would dip from 17.3 percent in 2017 to 16.3 percent in 2019 as the TCJA takes full effect before rising to 17.8 percent by 2028. Encouragingly, the budget includes a number of thoughtful spending reforms. Compared to last year's budget, the focus on controlling Medicare costs is especially important – and the Medicare policies in the budget would all achieve savings by improving efficiency and value of care rather than cutting benefits for beneficiaries. Unfortunately, like last year, the budget relies on some extremely rosy economic assumptions and budget gimmicks that inflate its savings and distract from its actual policy reforms. The budget assumes real GDP growth will average around 2.9 percent over the next decade, including a short-term acceleration to as high as 3.2 percent in the next few years. This is much higher than other mainstream economic forecasts project and strains credulity, especially if interest rates and inflation also remain under control, as the budget predicts they will. The budget also retains a number of policies from last year that are unlikely to generate the substantial savings it claims they would, such as $151 billion from reducing improper payments and $48 billion from testing return-to-work strategies for Disability Insurance beneficiaries. Furthermore, the budget calls for an unrealistic 40 percent reduction in non-defense discretionary spending by 2028 – despite a lack of specificity as to where much of the funds will come from and despite the fact that the recent Bipartisan Budget Act of 2018 called for an increase in non-defense discretionary spending of over 10 percent. 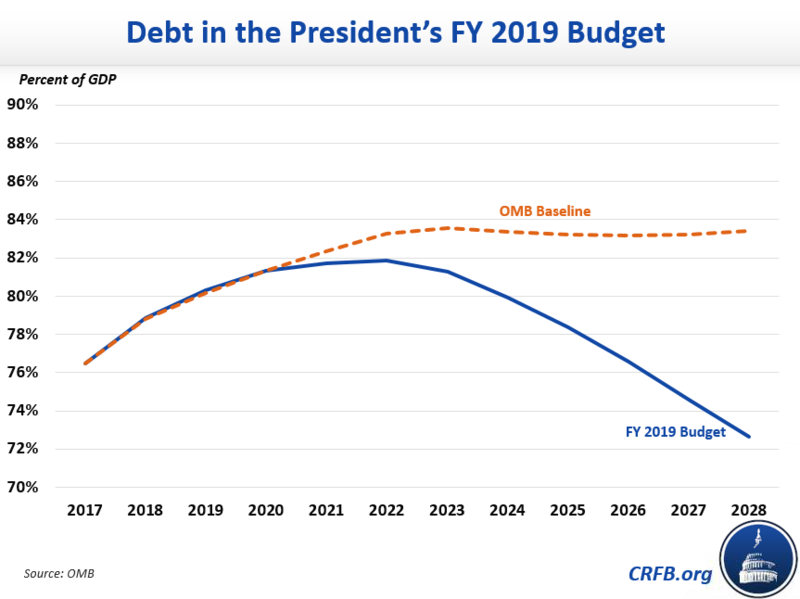 A realistic assessment of the President's budget is unlikely to show anywhere close to the deficit reduction needed to put the debt on a sustainable path. While the budget includes a number of important and thoughtful policies, it must do much more in order to truly right the fiscal situation. We will publish a more detailed analysis of the President’s FY 2019 budget later today and over the course of the week. All of our papers and blogs on the budget will be collected here. Our analyses of past budgets can be found here.